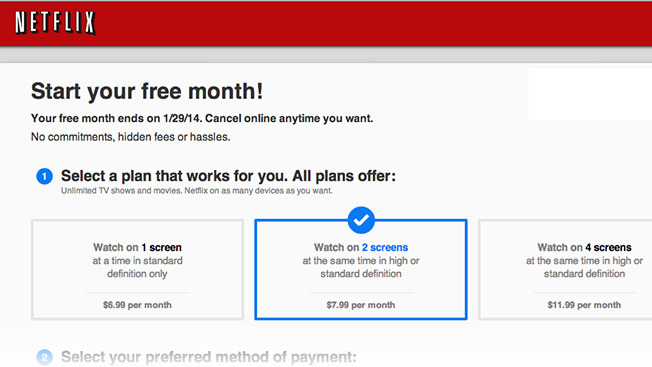 Netflix has cracked down on password sharing this year (the streaming service has a $12-per-month plan if you want to stream on four devices simultaneously), but it looks like there's a new tier to its pricing plan, albeit one available only to new users: you can now sign up for a single-screen standard-def stream for a dollar less than the hi-res, two-streams service most users are currently using. The service's user base has grown by leaps and bounds this year—Netflix passed top-dog pay-TV network HBO's domestic sub count with a whopping 40 million subscribers of its own—and it makes sense that the company would seek to expand that base yet further by adding new price points to entice more users. Its share price has been the main focus of financial reporting about Netflix, and so less attention has been paid to the ballooning content costs, which are headed nowhere but upward over the next few years. Future content costs for the company will extend into the billions of dollars based on existing agreements, and Netflix needs to grow revenue quickly enough to keep up with those costs. But ease of use and affordability are its two main selling points at the moment, so Netflix isn't in a position to either immediately institute a major price hike or crack down hard on pirates in a way that might jeopardize the experience of paying users. The question on the minds of those existing users, of course, is likely, "Hey, can I pay less, too?" Our tipster said that, in conversation with at Netflix customer service rep (who couldn't issue the new rate to an existing user), the rep said by way of apology, "This is just because we want to test it out among a group." So if you want one-stream standard def for a dollar less, you may be able to get it eventually—"[W]e will definitely offer it on a wider basis," the rep said. Update: "We always are testing new things and this is a test for a $6.99 single stream plan," said a spokeswoman. "Not all people will see this option and it may not be something we ever offer generally." Fingers crossed they do, because with the proliferation of cheap DSL accounts as ISPs crank up prices on high-speed Internet, standard-def to your one television sounds like a great deal for people who don't have every tech gadget on the market and just want to marathon Mad Men.